Beautiful Lindenwoods two story home located in a bay with stunning curb appeal and an amazing backyard. Over 2000 Sq. 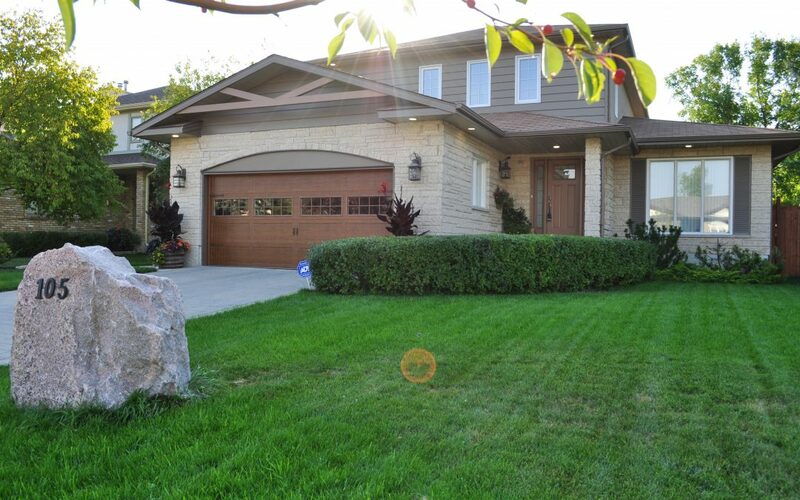 Ft. this home has a paver stone style driveway, wood trusses added to the front of the home with stylish new garage door making it look like out of a magazine. The backyard too with it’s Grecian style pergola and charming landscaping. Inside you’ll find a large eat-in kitchen with island overlooking a sunken living room and fireplace. Formal dining room and front living room. Main floor powder room and laundry just off the oversized double car garage. Upstairs hosts three bedrooms, full bathroom and master with spacious ensuite with soaker tub and standup shower. Basement is partially finished and ready to be finished. A good start with full bathroom, new furnace and high efficient wall mounted hot water tank. A well designed layout with second to none curb appeal and a perfect location.